The data-descriptive power of Structorizer has been enhanced significantly in the most recent years (e.g. 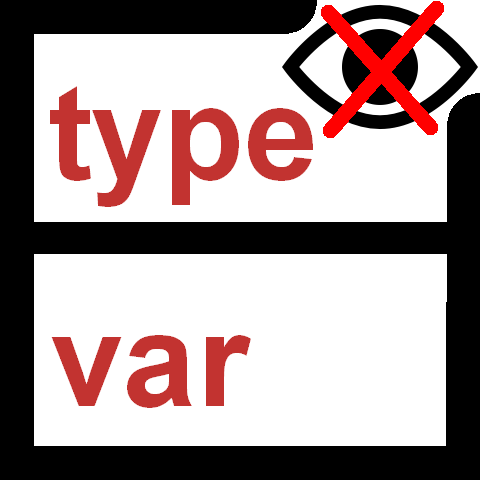 record type definitions, constant definitions, mere variable declarations). On the one hand, this was helpful in modeling more meaningful algorithms and particularly for source code import with as few losses as possible. To get back to the roots, i.e. to the original purpose of a Nassi-Shneiderman diagram, you might of course delete all the declarative parts but this way you would lose or at least compromise the possibilities of debugging (execution) and sensible code export. Similar to collapsing complex elements, an entire sequence of mere descriptive stuff (type definitions and variable declarations without initialization) will then only be represented by a surrogate (placeholder) element looking exactly like a collapsed instruction but with a specific icon: (which is the same as in the menu item). 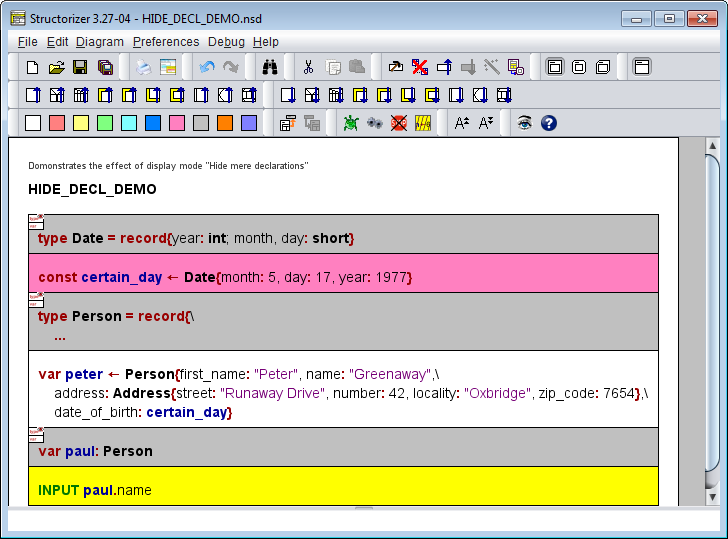 Structorizer automatically detects the maximum extension of declaration sequences. In contrast to collapsing, however, this is not an element-individual modification but a global display setting (like comment display modes), i.e. 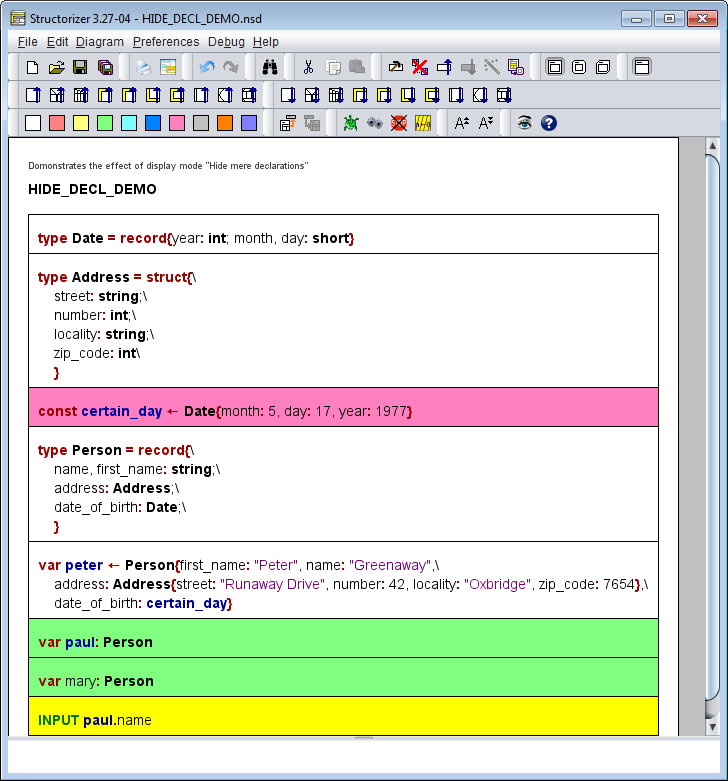 it affects all declaration parts throughout all diagrams at once. To enable or disable this mode has absolutely no impact on the diagrams themselves. Note: On editing a diagram be aware that the surrogates of declarative sequences represent them as a whole, i.e. if you delete or move a surrogate, this will always affect the entire sequence hidden behind it! If you add a new declaration element directly after or before such a surrogate in mode "Hide mere declarations?" then you shouldn't expect to see this new element because it will immediately be hidden as well. In case you inserted it before the former surrogate, however, it will take its place, i.e. its first line will now appear as visible surrogate content.